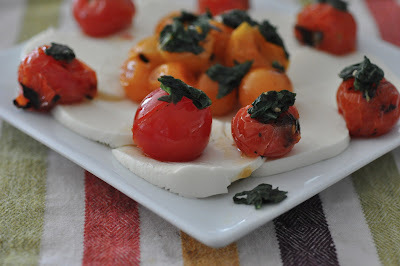 Fit for Roman Gods, this mozzarella salad with grilled cherry tomatoes and slightly charred basil is is a super easy version of a traditional Caprese Salad (which literally means "from Capri" off the southern coast of Italy) -- the extra effort to gently grill the tomatoes and char the basil leaves is worth it. D-E-L-I-Z-I-O-S-A. 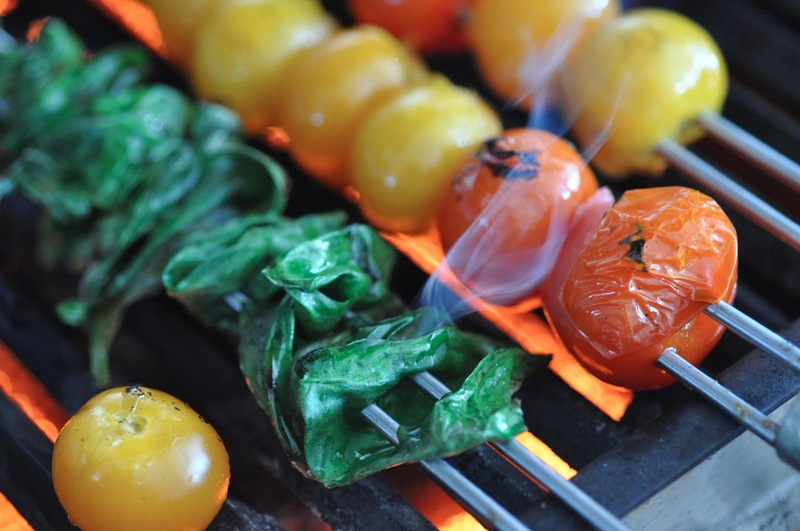 Preheat an outdoor grill (a stove top grill pan can be substituted). 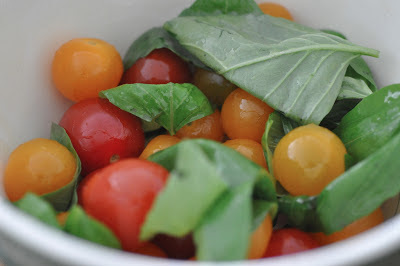 Coat a quart of cherry tomatoes and basil leaves with olive oil. Thread the tomatoes onto skewers being careful not to split the tomatoes. 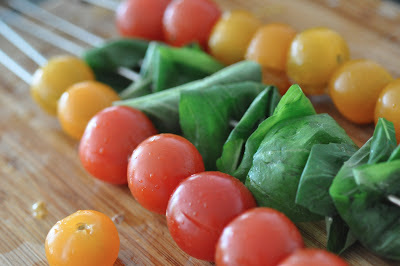 Place 4-5 oiled basil leaves one on top of the other and fold into quarters before threading onto their own skewer. Repeat until you've used all the basil leaves. Grill tomatoes and basil over a low heat turning every 1-2 minutes (or more often so as not to burn) until the tomatoes and basil have char marks. The basil will be done very quickly. Remove and set vegetables aside to cool. Using a sharp knife, slice cheese into 1/4 inch thick rounds and arrange on a platter. Top cheese with tomato and basil. If desired, salt sparingly and drizzle additional olive oil over the salad before serving. 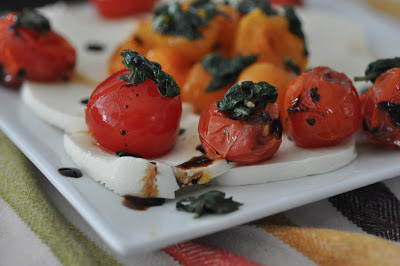 Although the traditional Italian Caprese salad recipe does not include balsamic vinegar, a light drizzle can add an extra dimension to this awesome summer salad recipe.